"Robin Williams does a hilarious Shakespeare improv on Johnny Carson's Tonight Show in 1991. Watch more Robin Williams at http://bit.ly/carson_robin. Subscribe to Johnny Carson's Official YouTube Channel http://bit.ly/johnnysub." TEDxAldeburgh - Akala - Hip-Hop & Shakespeare? "Akala demonstrates and explores the connections between Shakespeare and Hip-Hop, and the wider cultural debate around language and it's power. MOBO award-winning hip hop artist 'Akala' is a label owner and social entrepreneur who fuses rap/rock/electro-punk with fierce lyrical storytelling (think Wu-Tang Clan and Aphex Twin meets Rage Against The Machine). With Akala's latest record, convention-defying album DoubleThink, Akala has proven himself as one of the most dynamic and literate talents in the UK. Inspired by the likes of Saul Williams and Gil Scott Heron, Akala has also developed a reputation for stellar live performances with his drummer Cassell 'TheBeatmaker' headlining 5 UK tours and touring with everyone from Jay-Z, Nas & Damian Marley, M.I.A. and Christina Aguilera to Siouxsie Sue and Richard Ashcroft, appearing at numerous UK / European and US festivals (Glastonbury, Big Chill, Wireless, V, Hove and SXSW) also partnering with the British Council promoting British arts across Africa, Vietnam (the first rapper to perform a live concert in Vietnam), New Zealand and Australia. In 2009, Akala launched the 'The Hip-hop Shakespeare Company', a hotly-tipped music theatre production enterprise which has sparked worldwide media interest since its inception. Previous collaborators include: British actor; Sir Ian McKellen, actor/musician; Colin Salmon and Royal Shakespeare Company Voice Director; Cicely Berry. 2011 sees the launch Akala's latest endeavour 'Illa State Productions' to garner his budding scriptwriting talent alongside TV presenting and as a music composer for various TV and Film projects. In the spirit of ideas worth spreading, TEDx is a program of local, self-organized events that bring people together to share a TED-like experience. At a TEDx event, TEDTalks video and live speakers combine to spark deep discussion and connection in a small group. These local, self-organized events are branded TEDx, where x = independently organized TED event. The TED Conference provides general guidance for the TEDx program, but individual TEDx events are self-organized. * (*Subject to certain rules and regulations)"
"A Midsummer Night's Dream" by The Beatles? The Beatles were an English rock band formed in Liverpool in 1960. Their best-known lineup, consisting of John Lennon, Paul McCartney, George Harrison, and Ringo Starr, became considered by many as the greatest and most influential act of the rock era. Rooted in skiffle and 1950s rock and roll, the Beatles later utilized several genres, ranging from pop ballads to psychedelic rock, often incorporating classical elements in innovative ways. In the early 1960s, their enormous popularity first emerged as "Beatlemania", but as their songwriting grew in sophistication, they came to be perceived by fans and cultural observers as an embodiment of the ideals shared by the era's sociocultural revolutions. Read more . . .
A humorous spoof of Shakespear's A Midsummer Night's Dream (Act V Scene I), in which John portrayed the beauteous lady "Thisbe", Paul "Pyramus", George "Moonshine" and Ringo "Lion", all attired in costume. Apart from this, John, Paul and George were seen at the very start of the show, miming a trumpet fanfare. English is a West Germanic language that was first spoken in England and is now the most widely used language in the world. It is spoken as a first language by a majority of the inhabitants of several nations, including the United Kingdom, the United States, Canada, Australia, Ireland, New Zealand and a number of Caribbean nations. It is the third most common native language in the world, after Mandarin Chinese and Spanish. It is widely learned as a second language and is an official language of the European Union, many Commonwealth countries and the United Nations, as well as in many world organizations. English arose in the Anglo-Saxon kingdoms of England and what is now south-east Scotland, but was then under the control of the kingdom of Northumbria. Following the extensive influence of Great Britain and the United Kingdom from the 17th century to the mid-20th century, via the British Empire, and of the United States since the mid-20th century, it has been widely propagated around the world, becoming the leading language of international discourse and the lingua franca in many regions. Historically, English originated from the fusion of closely related dialects, now collectively termed Old English, which were brought to the eastern coast of Great Britain by Germanic (Anglo-Saxons) settlers by the 5th century – with the word English being derived from the name of the Angles, and ultimately from their ancestral region of Angeln (in what is now Schleswig-Holstein). A significant number of English words are constructed based on roots from Latin, because Latin in some form was the lingua franca of the Christian Church and of European intellectual life. The language was further influenced by the Old Norse language due to Viking invasions in the 8th and 9th centuries. The Norman conquest of England in the 11th century gave rise to heavy borrowings from Norman-French, and vocabulary and spelling conventions began to give the appearance of a close relationship with Romance languages to what had then become Middle English. The Great Vowel Shift that began in the south of England in the 15th century is one of the historical events that mark the emergence of Modern English from Middle English. Owing to the assimilation of words from many other languages throughout history, modern English contains a very large vocabulary, with complex and irregular spelling, particularly of vowels. Modern English has not only assimilated words from other European languages but also from all over the world, including words of Hindi and African origin. The Oxford English Dictionary lists over 250,000 distinct words, not including many technical, scientific, and slang terms. Modern English, which includes the works of William Shakespeare and the King James Bible, is generally dated from about 1550, and when the United Kingdom became a colonial power, English served as the lingua franca of the colonies of the British Empire. In the post-colonial period, some of the newly created nations which had multiple indigenous languages opted to continue using English as the lingua franca to avoid the political difficulties inherent in promoting any one indigenous language above the others. As a result of the growth of the British Empire, English was adopted in North America, India, Africa, Australia and many other regions, a trend extended with the emergence of the United States as a superpower in the mid-20th century. like to show only one during a classroom presentation. Elizabeth I (7 September 1533 – 24 March 1603) was queen regnant of England and Ireland from 17 November 1558 until her death. Sometimes called "The Virgin Queen", "Gloriana" or "Good Queen Bess", Elizabeth was the fifth and last monarch of the Tudor dynasty. The daughter of Henry VIII, she was born a princess, but her mother, Anne Boleyn, was executed two and a half years after her birth, and Elizabeth was declared illegitimate. Her half-brother, Edward VI, bequeathed the crown to Lady Jane Grey, cutting his two half-sisters, Elizabeth and the Catholic Mary, out of the succession in spite of statute law to the contrary. His will was set aside, Mary became queen, and Lady Jane Grey was executed. 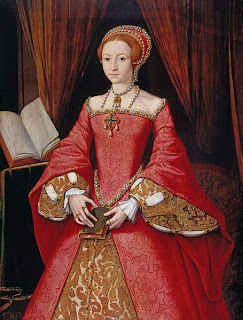 In 1558, Elizabeth succeeded her half-sister, during whose reign she had been imprisoned for nearly a year on suspicion of supporting Protestant rebels. Elizabeth set out to rule by good counsel, and she depended heavily on a group of trusted advisers led by William Cecil, Baron Burghley. One of her first moves as queen was the establishment of an English Protestant church, of which she became the Supreme Governor. This Elizabethan Religious Settlement later evolved into today's Church of England. It was expected that Elizabeth would marry and produce an heir so as to continue the Tudor line. She never did, however, despite numerous courtships. As she grew older, Elizabeth became famous for her virginity, and a cult grew up around her which was celebrated in the portraits, pageants, and literature of the day. In government, Elizabeth was more moderate than her father and half-siblings had been. One of her mottoes was "video et taceo" ("I see, and say nothing"). In religion she was relatively tolerant, avoiding systematic persecution. After 1570, when the pope declared her illegitimate and released her subjects from obedience to her, several conspiracies threatened her life. All plots were defeated, however, with the help of her ministers' secret service. Elizabeth was cautious in foreign affairs, moving between the major powers of France and Spain. She only half-heartedly supported a number of ineffective, poorly resourced military campaigns in the Netherlands, France, and Ireland. In the mid-1580s, war with Spain could no longer be avoided, and when Spain finally decided to attempt to conquer England in 1588, the failure of the Spanish Armada associated her with one of the greatest victories in English history. Elizabeth's reign is known as the Elizabethan era, famous above all for the flourishing of English drama, led by playwrights such as William Shakespeare and Christopher Marlowe, and for the seafaring prowess of English adventurers such as Sir Francis Drake. Some historians are more reserved in their assessment. They depict Elizabeth as a short-tempered, sometimes indecisive ruler, who enjoyed more than her share of luck. Towards the end of her reign, a series of economic and military problems weakened her popularity. Elizabeth is acknowledged as a charismatic performer and a dogged survivor, in an age when government was ramshackle and limited and when monarchs in neighbouring countries faced internal problems that jeopardised their thrones. Such was the case with Elizabeth's rival, Mary, Queen of Scots, whom she imprisoned in 1568 and eventually had executed in 1587. After the short reigns of Elizabeth's half-siblings, her 44 years on the throne provided welcome stability for the kingdom and helped forge a sense of national identity. Read more of this article here . . .
Video by Horrible Histories about Queen Elizabeth's love life. Tudor and Elizabeth Portraits. Tudor and Elizabethan portraits and other works of art, provided for research and education. Retrieved 15 December 2007.